ESL SEVEN-EIGHT: Using the Past Perfect Tense. 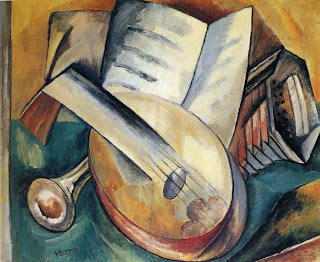 "Still Life with Musical Instruments"
Combine Two Sentences To Make One. 1. I got to the bank. It closed. By the timeBy the time I got to the bank, it had closed. 2. He went to Canada. He read several books about it. BeforeBefore he went to Canada, he had read several books about it. 3. I arrived at the party. The food was eaten. By the timeBy the time I arrived at the party, the food had been eaten. 4. Jack called for an interview. He wrote his resume. BeforeBefore Jack called for an interview, he had written his resume. 5. Jane got to the concert. It already started. By the timeBy the time Jane got to the concert, it had already started. 6. He arrived at the airport. He realized he forgot his passport. WhenWhen he arrived at the airport, he realized he'd forgotten his passport. 7. She decided to buy one. She looked at a lot of dresses. BeforeBefore she decided to buy one, she had looked at a lot of dresses. 8. Aaron got hired. He went on a lot of interviews. BeforeBefore Aaron got hired, he had gone on a lot of interviews. 9. We ate at the cafeteria. We went to class. AfterAfter we had eaten at the cafeteria, we went to class. We went to class after we had eaten at the cafeteria. 10. Maria fed the cat. She called her mother. AfterAfter Maria had fed the cat, she called her mother. 11.I woke up this morning. My roommate already left. By the timeBy the time I woke up this morning, my roommate had already left. 12. Sam knew Paris very well. He visited the city several times. becauseSam knew Paris very well because he had visited the city several times. Because Sam had visited Paris several times, he knew the city very well. 13. I didn't know how to cook salmon. I never cooked it. becauseI didn't know how to cook salmon because I had never cooked it. 14. Mary moved to Istanbul. Bill already bought a house there. BeforeBefore Mary moved to Istanbul, Bill had already bought a house there.Bill had already bought a house in Istanbul before Mary moved there. 15. You were hired by the company. I already got a raise. BeforeBefore you were hired by the company, I had already gotten a raise. 16. I didn't go dancing last night. I went dancing the night before. becauseI didn't go dancing last night because I had gone dancing the night before. 17. I arrived at the meeting. It already ended. By the timeBy the time I arrived at the meeting, it had already ended. 18. Shiela didn't attend the conference. She went to one the previous weekend. becauseShiela didn't attend the conference because she had attended one the previous weekend. 19. Tom served his guests. He realized he forgot to set the table. WhenWhen Tom served his guests, he realized he'd forgotten to set the table. 20. Maria went out on a date. She realized she didn't comb her hair. WhenWhen Maria went out on a date, she realized she hadn't combed her hair. 21. My suit was ready. I gained some weight. By the timeBy the time my suit was ready, I had gained some weight.It didn't fit! 22. He won the chess match. He practiced for years. becauseHe won the chess match because he had practiced for years. 23. Patricia passed the English exam. She studied for a long time. becausePatricia passed the English exam because she had studied for a long time. 24. I arrived at the lake. The ice melted. By the timeBy the time I arrived at the lake, the ice had melted.I had wanted to go ice skating, but I couldn't. 25. I started watching the TV show. I realized I already saw it. WhenWhen I started watching the TV show, I realized I had already seen it. 26. Tom had a good interview. He prepared for it. becauseTom had a good interview because he had prepared for it. 27. They packed their suitcases. They took a taxi to the airport. AfterAfter they had packed their suitcases, they took a taxi to the airport. 28. They were afraid they forgot something. They packed so quickly. becauseThey were afraid they forgot something because they had packed so quickly. 29. The party ended. She met many new friends. By the timeBy the time the party ended, she had met many new friends. 30. The students finished the exercises. They understood the grammer. AfterAfter the students had finished the exercises, they understood the grammar.